I don’t know about you, but I’m a major creature of habit. I wake up every morning around 6am usually, I say “GOOD MORNING!” to Jackson in a high pitched annoying dog-mom voice, I check how much I slept on my FitBit, I make a cup of coffee from my Nespresso Vertuo machine and add collagen, heavy cream and stevia to it. Then I sit on the couch with Jackson in my lap and I finish up my blog post for the day. Exactly what I’m doing at the moment. But you know how I’ve mixed it up lately? I’ve gotten a little crazy. I’ve started adding cinnamon to my coffee. All thanks to Joy of Girls Gone Wod. I know cinnamon in coffee isn’t such brand new concept, but I had never tried it. I really never understood the point of the cinnamon on the Starbucks counter. But Joy knows everything so I copied her in Lake Tahoe and now my addiction has become my morning routine. If you haven’t tried cinnamon in your coffee, especially in a Nespresso Vertuo cup of coffee…do it now. Just be prepared to never leave the house again. Like me. Another obsession is my air fryer. I’ve shared the pros and cons of having an air fryer in past air fryer recipe posts, but I still feel like I need to share those details every time since air fryers are such a new thing. So I’ll quickly share pros and cons. I have the NuWave 6qt Air Fryer and I love ittttt. Pros – I don’t have to heat up the house with the oven in the summer time, I don’t have to wait for the oven to pre-heat, I don’t have to dirty my oven when cooking chicken wings, my house doesn’t smoke up like it does with the oven sometimes (because the chicken wings made it so damn dirty), I can cook meat and veggies faster than in the oven, and lastly I can get brussels sprouts crispier than the oven. Example a. Cons – it’s massive and hard to store. But since I love it so much, I use it every single damn day. I’m in love with it. Especially when it comes to making brussels sprouts. Traveled to Dallas to visit family and got reminded why I’m not interested in reproducing. Traveled to Charleston to chow down on some Southern food and remind myself why I don’t live somewhere warm and humid – bad hair and hurricanes. Came home to do another profractional treatment and stayed indoors for 3 days straight – in turn I made Chocolate Chip Cream Cheese Pumpkin Muffins, Pumpkin Cheesecake Bars, Biscuits & Gravy Casserole, Chocolate Tahini Cookies, and Chocolate Pecan Pie Cookie Cobbler. Holiday season is the best. Doing my friends makeup tomorrow night as a test run for her makeup on her wedding day in New Zealand. Planning for our trip to New Zealand next month!! In horrible need of a pedicure. That’s about it. And since I was stuck indoors for 3 days straight in hopes of not scaring the community with my bloody face, I tried out instacart for the first time. And I have to say, I was disappointed. I needed a couple items ASAP so I asked for 1 hour delivery time. On my $11 order, after taxes, tips and delivery fee, my total was $34!! WTF! Luckily I have the best people ever on instagram who told me about Amazon Prime Now! Which I had never heard of and feel old now because of. With my Amazon Prime account, I can order groceries from Whole Foods and get free 2 hour delivery! How rad is that?! And now I know that I can remove my face more than once a year because Amazon Prime Now will just leave the groceries on my doorstep and I never have to see the person with my horror show face. I’ve been recording video day by day of this profractional treatment and I CAN’T WAIT to share it with you! 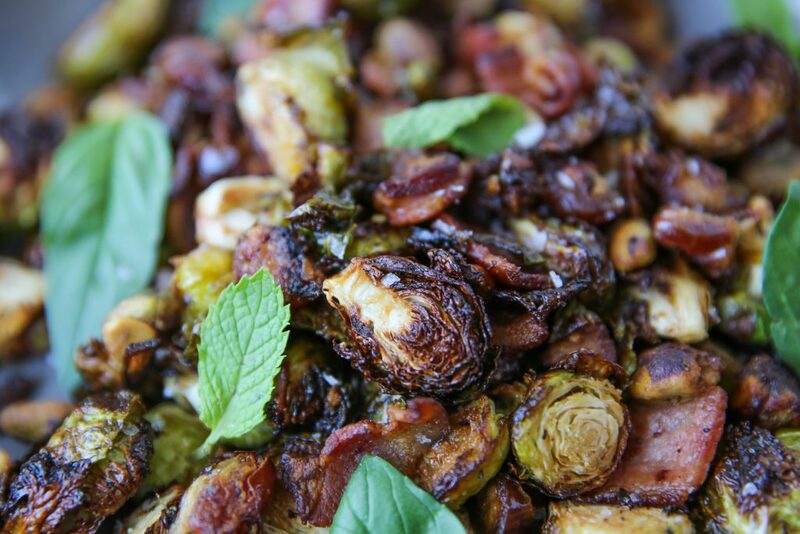 Anywho, GO MAKE THESE BRUSSELS SPROUTS! 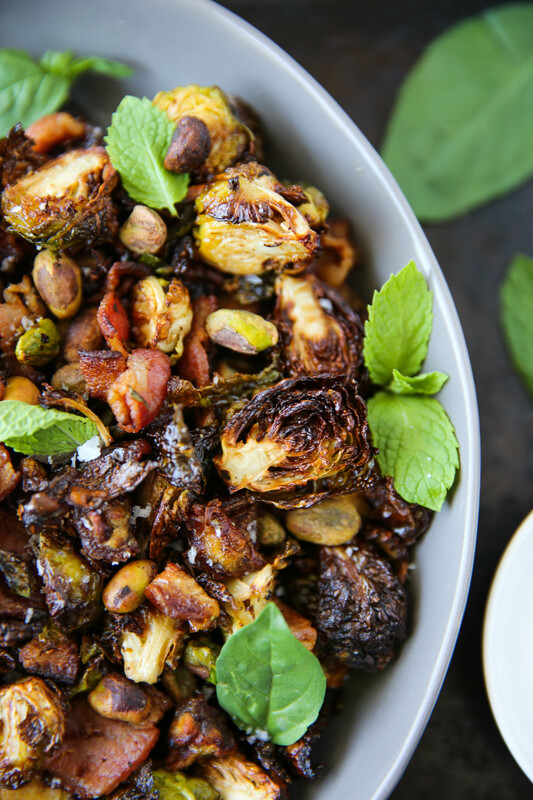 Toss Brussels sprouts in oil and lime juice along with salt and garlic powder. Place in the wire basket of air fryer (I use a 6qt air fryer). Turn temperature up to 385 degrees F and time up to 25 minutes. Cook for 15 minutes, pausing the air fryer every 5 minutes to toss the Brussels sprouts. 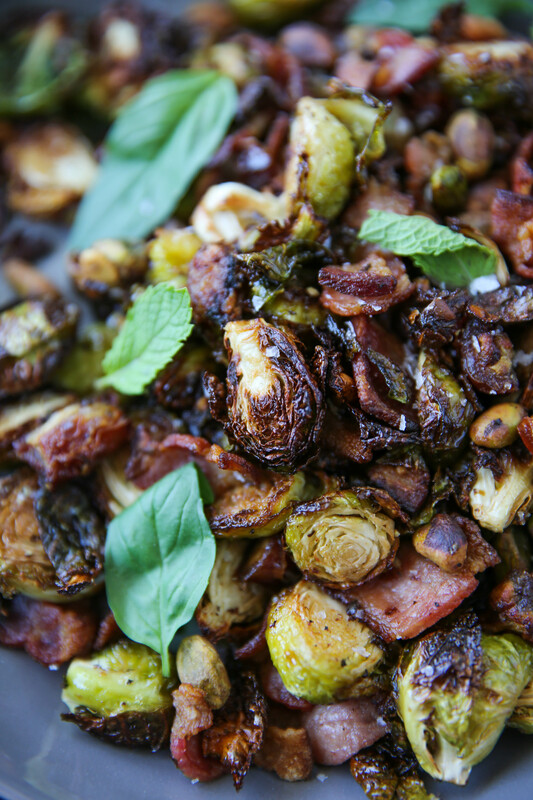 When there is 10 minutes left, add pistachios and dates on top of the Brussels sprouts then top it all with bacon. Cook for the last 10 minutes, tossing at the 5 minute mark. Once finished cooking, add to a bowl and toss with a little extra lime juice, salt and pepper and then top it all with basil and mint leaves. I’ll have to try your recipe! I made brussel sprouts in my air fryer the other day. They didn’t turn out very good, but I was also just winging it with no recipe. I love trying new things in the air fryer, I did crab cakes; they were so yummy! OMG! You’re coming to NZ! Yaaaay! How long are you here for? Where will you go? Sorry to warn you, but you’re going to hate the flight…..it’s so long! we are there for 10 days and we will mostly be in wanaka and queenstown. and yes, that flight is going to majorly blow. i will be happily taking sleeping pills for the 12 hour flight. Oh, can’t wait to hear about your NZ trip!!! I am going there in late December. so so pumped for that experience! i’ll be recapping it in early december! This looks amazing! I can’t wait to try it! 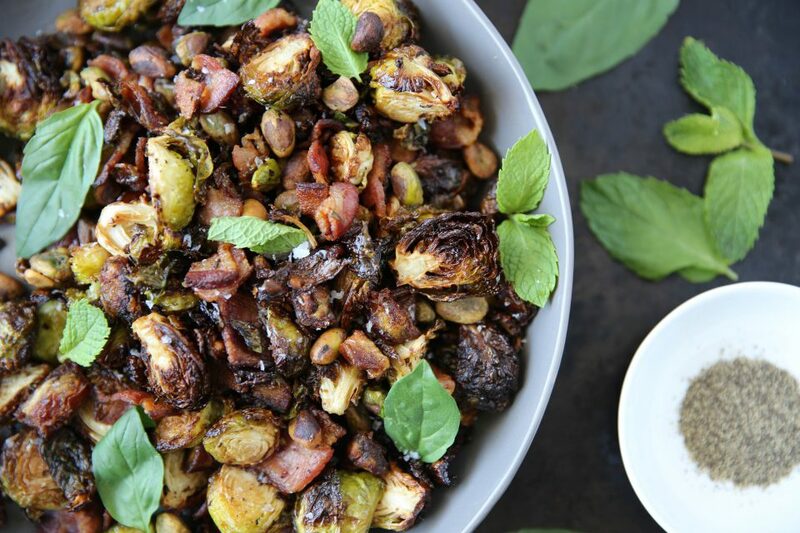 This could be a great thanksgiving side dish. You mentioned you’ve done steak in the air fryer… how did it turn out? I’d love all the cooking details! I just bought an air fryer and I’m trying to figure out new ways of using it. You’re the best! 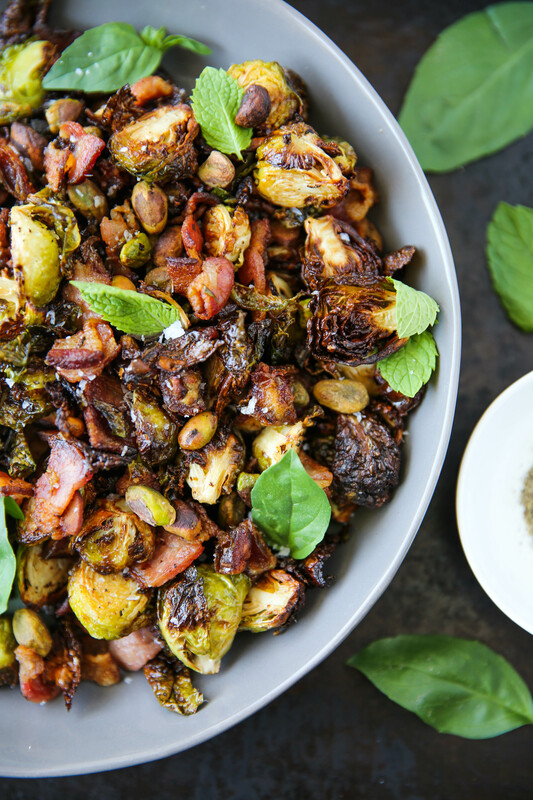 definitely a great thanksgiving side dish! and i thought the steak was OK, i definitely need to test it a couple different ways first and then i’ll give you the deets on how to do it. i just need to perfect it first! after seeing you started adding cinnamon to your coffee, i tried adding pumpkin spice to mine (so basic). if you havent tried it, DO IT! that sounds amazing!! i’ll try that this week! 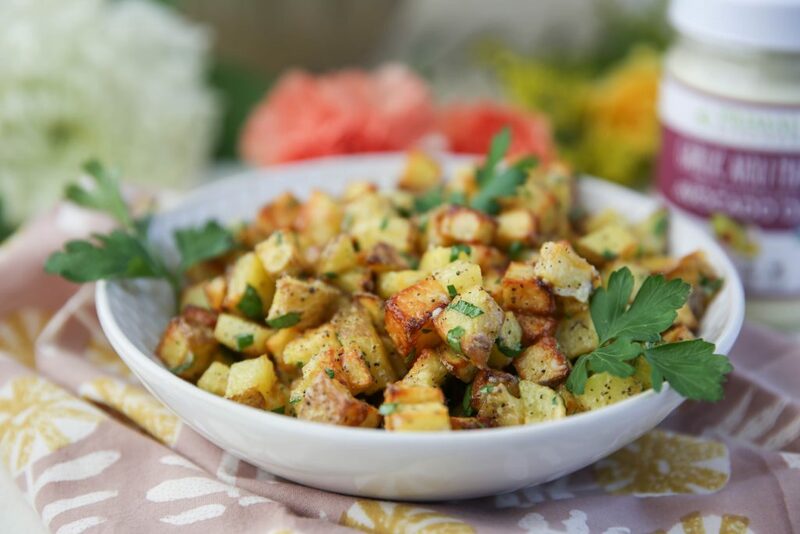 I’m so excited to try this recipe in my Breville air fryer! I noticed there was bacon in the ingredients, but not in the directions. Can you please clarify? just checked the post and the bacon is in step 2! As per usual, this was another AMAZING recipe. Our house would be a sad, sad place at dinner time if it weren’t for you and your delicious recipes! I don’t have an air fryer but I made them in my convection oven and they turned out amazing! Even my friend who “doesn’t like vegetables” said they were really good while the rest of us ate ourselves sick with them. I can’t wait to serve these at Thanksgiving this year! Thanks for sharing your inspiration with other, my hubby and I love your work! yayyyyy!! so glad you guys liked this recipe! I just made these to test for thanksgiving… The only thing I did was omit the lime juice. And then drizzled a little bit of balsamic reduction on top at the end. They were so good! My husband absolutely love them! 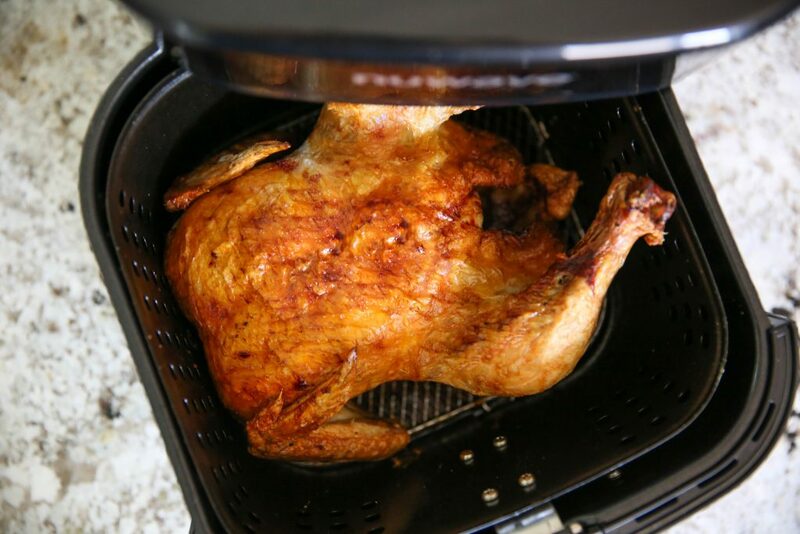 Thanks so much for your recipe…my air fryer has been intimidating me! ooooh the balsamic reduction sounds amazing! awesome!! so glad you liked it Daena! Do you cook the bacon before you fry it? Maybe I’m overthinking it ha! Is the bacon cooked or uncooked when added? Thanks! uncooked. the cooking video actually shows that so you can always check those videos out if you have any questions! Can I make without the BACON???? Absolutely love this recipe! It’s sweet, salty, crunchy and chewy all in one. awesome!! so glad you liked it Paige!